Bethesda Softworks has revealed that the PC version of Fallout: New Vegas will require activation on Steam. As part of a Q&A series on the Bethsoft forums between Fallout fans and the New Vegas team at Obsidian and Bethesda, Senior Producer Jason Bergman revealed that the PC version of the upcoming RPG will require Steam activation. "Fallout: New Vegas uses Steamworks for achievements and other features (such as friends lists, cloud storage of user preferences and so on)," he said. "Use of Steam will be mandatory at retail." "We've implemented Steamworks in as light and unobtrusive a way as possible. Yes, you will have to install Steam when you install Fallout: New Vegas if you don't already have it. And yes, you will have to be online at the time of that initial install," he continued. "However you can install the game on as many systems as you want (with no restrictions! ), and you do not have to be online to play the game after your initial activation. Not only that, but once the game has activated on Steam, you can throw out the game DVD entirely and just download the game over Steam." The Steam requirement is especially interesting in light of the fact that Bethesda's first Fallout game, Fallout 3, was a Games For Windows Live title. Explaining the switch away from Microsoft's struggling PC service, Bergman said, "We made the decision to use Steam after looking at all the various options out there and decided that it provided the best, least intrusive experience for PC gamers." Gamers worried about making and using mods can also relax. "This will have no affect on mod development whatsoever," he added. "Modders will still be able to create and distribute their plugins the same way they have in the past." 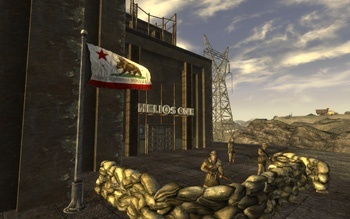 Fallout: New Vegas is scheduled to come out this fall for the PC, PlayStation 3 and Xbox 360.